Hold’em with Holloway, Vol. 74: @ChadAHolloway talks with @RyanTepen about a six-bet pot. In April 2016, I bid readers adieu as Hold'em with Holloway came to an end after 73 editions. Little did I know at the time, it would only be a two-year break. That's because Hold'em with Holloway is back, and we're going to pick up right where we left off! I plan to cover a wide variety of topics in this weekly column (the plan is to release new articles every Wednesday). One thing I want to focus on is picking interesting hands that I either play or witness as a poker reporter and run them by established pros for their take. Tepen: "I think one of the biggest skills in no-limit hold'em is bet sizing." That might mean either consulting an outside pro or, if I have my way, talking with the players involved to get inside their heads. With that in mind, this week's hand comes from the $1,100 buy-in 2018 MSPT Iowa State Poker Championship, a tournament that drew 455 entries and wrapped up this past weekend at Meskwaki Casino. It happened on Day 1a in Level 6 (200/400/50) when a player in middle position opened with a raise to 900 and Missouri's Ryan Tepen three-bet to 3,000 from the hijack. Action folded back to the original raiser and he four-bet to 7,000. Tepen took his time before pushing back with a five-bet to 15,000 and his opponent six-bet jammed for 62,500. Tepen, who had 63,425, snap-called and tabled , which was well ahead of his opponent's . The flop made things interesting by giving Tepen's opponent a pair of kings, but neither the turn nor river changed a thing and Tepen took over the chip lead with about 130,000. It seemed fairly standard, but there was actually some artful finesse in it — namely, Tepen finding just the right sizing to induce his opponent's shove. "I definitely thought about flatting, but I knew he liked his hand," Tepen explained. "Basically, I was trying to figure out how to get most of his chips in the pot. He was a guy who likes to see three [more cards] — he likes to see flops — and I knew he liked his hand, so he was going to see a flop regardless. It was about trying how to size it right." He continued: "With him having 60K I thought about going to 20K, but expecting him to see a flop I think the most I could've gone is 18K. I went with 15K though, hoping that it might give him some room to go ahead and go for it, and he piles." "Against certain people I don't think it matters how much you make it, but against others you have to price it just right. I think one of the biggest skills in no-limit hold'em is bet sizing. Against certain people they're not going to call unless you min-raise, so sometimes you want to go smaller. Against others you can go bigger." I also asked Tepen a hypothetical. Had he just called the four-bet and the flop comes king-high, would he still have gotten it in or would he have been worried about being set up? "You don't really want to go broke for 150 big blinds with one pair, so that's another reason to go ahead and put in the five-bet," he said, though he admitted he'd still probably get it in. 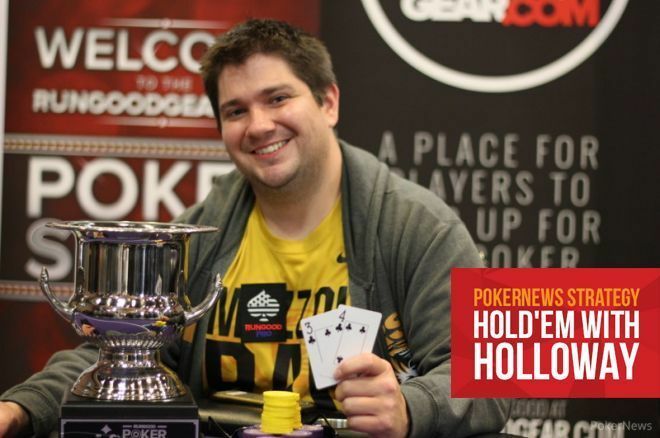 For a further inside look at all things poker, follow Chad Holloway on Twitter at @ChadAHolloway. You can also listen to him on PokerNews' very own LFG Podcast. Along with co-host Jamie Kerstetter, the duo cover all things in the mid-major poker scene.